I found these wire baskets at Gordman's for $10. I thought they were so cute so bought two, they were yellow and green and I kind of liked the yellow and green but decided I would like them even better if they looked like an old wire basket. 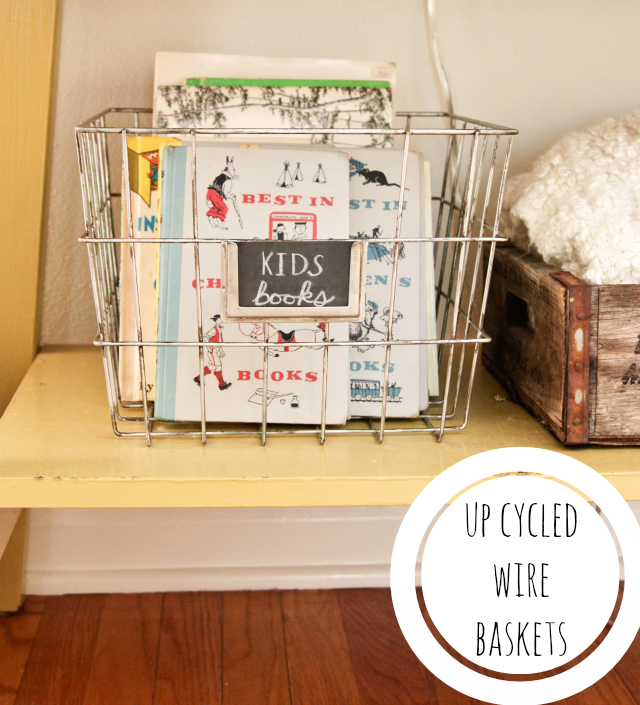 The process of changing them from a colored wire basket to a metal wire basket was pretty quick. 1. Spray paint the metal silver. I also did this same technique to a rubber basket-one of those cheap ones from the dollar store and it didn't look as good, so I would say look for a metal basket. 2. Paint the basket with a dark brown paint. You can use any type of paint, whether it be craft paint, or wall paint. I have even used dark shoe polish before. Paint just a little bit at a time so that you can wipe it off before it dries too much. 3. Use a dry rag to wipe the paint off- a little paint will stick in the grooves and corners giving it the antiqued look. You will be left with a vintage looking basket. Definitely beats the colored ones I had before! These baskets had a little slot in the front for a name card so I spray painted some card stock with my chalkboard paint and cut it to fit in the slot. With some chalk, I wrote little labels on the baskets and filled them with some vintage kids books I got from a vintage market.